It’s easier than you may think to replace a toilet in your home. And, it’s fast. Just ask a few homeowners who tackled the DIY project recently. For Adams, who has two young daughters at home, selecting the Denali Power Flush toilet was important because of the powerful flushing capabilities. Providing single flush confidence, Denali features superior flushing performance that’s more than 20 percent greater than the highest MaP rating, moving 1,200 grams of waste with 1.6 Gpf. Both Davis and Adams have written reviews of their Mansfield toilet installation experiences. 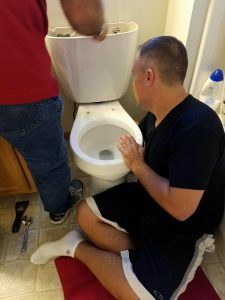 To see the step-by-step blog postings, go to http://mistymorgan.blogspot.com/2016/11/mansfield-plumbing-summit-dual-flush.html and http://www.emilyreviews.com/2016/10/mansfield-plumbing-denali-toilet-review-giveaway-us-canada-1103.html.